Now that Chelsea Clinton and Marc Mezvinsky have gotten married in Whitebeck, NY, some details of the wedding have been reported. The New York Times reports that the interfaith ceremony was co-officiated by Rabbi James Ponet and Reverend William Shillady. Jim Ponet, a Reform rabbi, is Yale University’s Jewish chaplain. His official title is director of the Joseph Slifka Center for Jewish Life at Yale, which is the campus Hillel there. The NYT also says that the "family said the ceremony would celebrate and honor elements of both traditions. It would include friends and family reading the [Sheva Brachot] Seven Blessings, which are typically recited at traditional Jewish weddings following the vows and exchange of rings." According to this photo the groom wore a kippah (yarmulke) and tallit (prayer shawl). The tallit is not required at Jewish weddings, though some grooms choose to wear one and some grooms choose to wear the white kittel (robe). Supposedly a ketubah (wedding document) was also witnessed and signed before the ceremony. Since a guest list hasn't been released, I decided to come up with a quick list of people I am certain were not there. I still can't wrap my brain around the fact that there are rabbis who will participate in an interfaith marriage. The very concept of Methodist Christianity is a direct contradiction of the Sh'ma, our most important prayer. How does one profess to be a teacher of Judaism while officiating in a ceremony that undermines its very nature? I love your list of non-invited and albeir being a non-invited myself, I can vouch for its truthfulness. Also, judging by the picture, who cfould have guessed that it wasn't a 100 percent Jewish wedding? pictures can sometimes deceive. I love this one, especially for the list at the end! "The tallit is not required at Jewish weddings..."
No, a tallit is not required, but a Jewish bride is required at a Jewish wedding. I see your list on who was not invited. I see no mention of the Mezvinsky family, who I assume were invited. 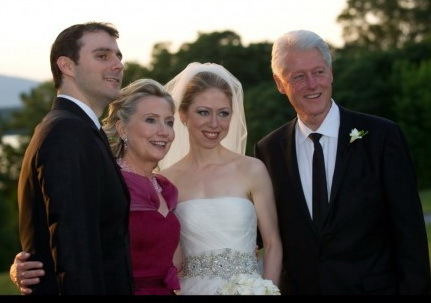 Surprised anyone from the Mezvinsky family chose to have a Jewish wedding...although perhaps that's unfair. I am most familiar with the family member who has been one of the most active Jewish anti-Zionists. I'd prefer that he and his family convert and just leave us alone.